Want to create a website business around your interests or hobby? 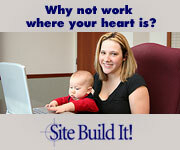 Want to be one of the moms that work from home in her spare time? Are you a student looking to earn a bit of extra cash? Retired? Want to make extra income using your knowledge or hobby? Try the comprehensive and well-written free webmaster course and other free online business courses for yourself. Click a link to start reading now, or right-click to download a course for reading or printing off-line. It's Official....Quitting My Day Job My First $10,000 Month! Thank You SBI! 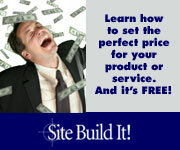 "You, like me, could create a business website that's successful. I’ve become more enamoured of SBI! as ... I've realised that, just for once, the reality matched the hype. It's the one I recommend to friends and relatives wanting to create a business website." From experience I know that being a webmaster involves a lot more than wanging up a website and waiting for the visitors to arrive. Chance are they wont, and your website will very likely become one of the unvisited stars of cyberspace. You might be tempted by free hosting with an easy to create website (although in my experience not all of the free hosts offer stable or so easy to build websites. You might be dazzled by how quickly you can create a great looking shiny new site, but there are many such jewels lying hidden between the rocks. Little visited websites are no good to anyone, especially those who put them up. You need to follow the correct steps to create a website, start here with the free webmaster course. Learn to understand and create great websites, find out what are the best tools to create a website and create website traffic. Then build your knowledge - and your online business - using the other free online business courses: perhaps take the free netwriting course and one or more of the free online marketing courses, such as the free affiliate course. All-in-one - everything you need is included. To do the same on your own would involve a lot of time and cost. Eventually you'd wade your way through a minefield of products and guides, many of which would fall way short of the promises made about them. There's no need to buy "how to guides" or do lots of research for yourself: no need to reinvent the wheel! Step-by-step guidance through the whole process of planning, creating and promoting your website and business. If you want to understand and create great websites you must thoroughly plan, organize, optimise and promote them. You need to be effective with both people and search engines, including in the way you monetize your visitors. None of these are trivial matters, which is one reason why millions of websites and blogs disappear into the black-holes of cyberspace. With SBI! best practices will become a habit. 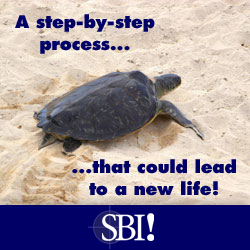 Easy stages - you're guided to doing the right thing at the right time. No need to muddle by, wondering what to do next. Clear guides and great videos lead you every step of the way. On occasions when I've wanted to know something specific the help desk staff were efficient, as well as being cheerful and polite. You have control of what is on your website and how it looks, as well as how well it is optimised for the search engines. You have control of the updating process. 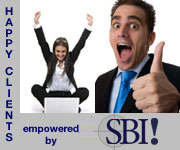 There's a whole lot of stuff you don't have to worry about, because SBI! are doing that for you. Constant updating and expansion of capabilities as changes occur with search engines, online capabilities and web practices. Standing Tall, Proud, And Confident...Thanks To SBI! Learn to understand and create great websites. 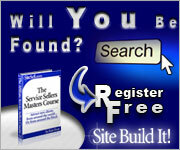 Start with the free webmaster course. Find out what are the best tools to create a website and create website traffic. 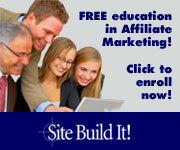 Build your knowledge - and your online business - using the other free online business courses. You could take the free netwriting course and one or more of the free online marketing courses, such as the free affiliate course. 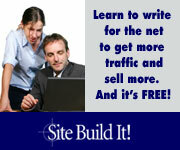 Get your free webmaster course now!